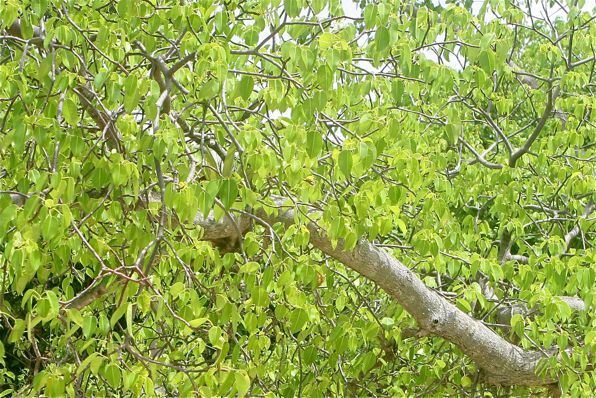 “The Caribs used the sap of this tree to poison their arrows and would tie captives to the trunk of the tree, ensuring a slow and painful death. A poultice of arrowroot (Maranta arundinacea) was used by the Arawaks and Taíno as an antidote against such arrow poisons. 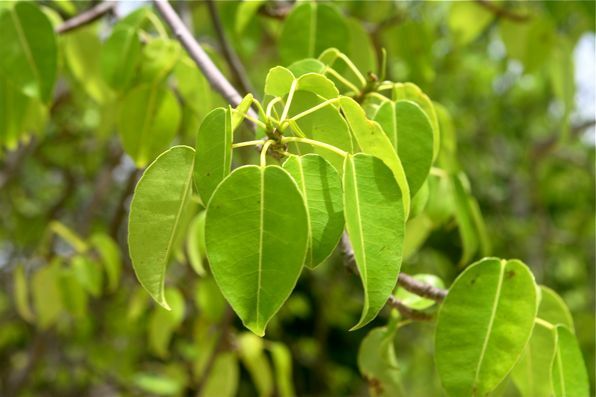 The Caribs were known to poison the water supply of their enemies with the leaves. Spanish explorer Juan Ponce de León was struck by an arrow that had been poisoned with Manchineel sap during battle with the Calusa in Florida, dying shortly thereafter. The thing is, yesterday we walked all over the Hog Island and these trees are everywhere. We had been walking through the brush before, totally oblivious to their existence. Rebecca even climbed one during our last island exploration. Perhaps we’re not all that sensitive to them, or she was just lucky. Regardless, now that we know what they look like, we’re avoiding them. It’s a pretty non-descript tree. You need to pay attention to what the leaves look like so that you can avoid them. If this wasn’t enough, we also came across a bunch of wicked-sharp thistle bushes that are scattered throughout the island. I noticed them after sticking one of their stupid thistles right in the front of my toe! These two, added to the Razor Grass that we came across on our last hike, now make three plants on our do-not-touch list. Believe me, you wouldn’t want to run into that bush. I lived in and worked as a Land Surveyor in the Caribbean for years. 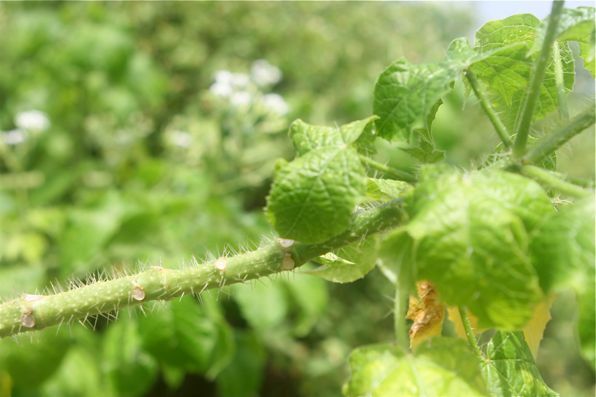 We would often come across and have to chop through “manchi”, razor grass, prickly vines and thorn bush. My arms and legs are still scarred from all the abuse. You may not have come across them yet but look out for “Jack Spaniards”. They are everywhere and will make your day a painfully memorable one. Thanks for the tip on the wasps. I had to google to find out what they were. I’ll keep my eyes open for them. Yeah, it’s a small price to pay for paradise. I know, but we forgot what they looked like. No we know! Ouch! Those bushes look painful. Glad to hear that Rebecca didn’t acquire some sort of painful rash while climbing those trees. Even paradise has its dangers! So does razor grass do what it sounds like it does – even if you just brush up against it? I wonder if those trees are in the BVI? I had never heard of them until now. Scary stuff!! The razor grass scratches you, and it will draw blood. We all had scratches from our hike yesterday. The Manchineel trees are in the Virgins. Between Manchineel trees, big waves, pirates and Cigua…Cruising must not be all that fun!!! Not at all. I think you should just stay up north. Yeah, that would NOT have been cool. In every Paradise there is a viper! I think that Manchineel trees are fairly widespread in tropical and subtopical areas. Nasty stuff! But even up here in Ohio we have poison ivy, oak, sumac, etc. It’s just that we’re used to them and don’t think of them as more than a nuisance to be avoided! You, of course, also have to watch out for jellyfish, especially box jellies! I do not like jelly fish. Fortunately I have been successful up to this point in avoiding them.